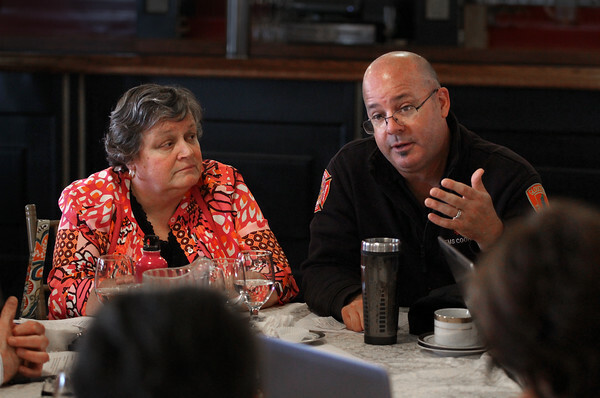 Sander Schultz, right, EMS Coordinator for the Gloucester Fire Department, speaks as Karen Carter, Assistant Director of Public and Leased Housing for the Gloucester Housing Authority, listens during an emergency preparedness exercise Wednesday at Cruiseport Gloucester. The event, hosted by the Cape Ann Emergency Preparedness Coalition, was attended by about 60 officials from emergency response and community service agencies from Gloucester, Rockport, Manchester, Essex and Ipswich. Attendees were given a hypothetical scenario -- a bomb threat at a senior housing project in each of the five communities -- and were asked to work together to come up with the best plan of action to quickly evacuate elderly residents and find emergency shelter for them. As the exercise progressed, various complicating factors were thrown into the mix: for example, participants were informed that some of the elderly evacuees had forgotten to bring along critical medicines and prescription cards. Part of the idea of the joint exercise, said Carol McMahon, program manager for Gloucester's Community Emergency Response Team, was to get responders from area communities working together to solve problems from a regional perspective. "We have to realize that if we have something like a major weather event," said McMahon, "it wouldn't just impact Gloucester. It would impact the region."